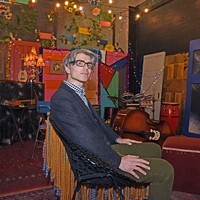 The Antagonist: Rising Richmond Filmmaker Rick Alverson is Challenging the Hollywood Formula | Cover Story | Style Weekly - Richmond, VA local news, arts, and events. 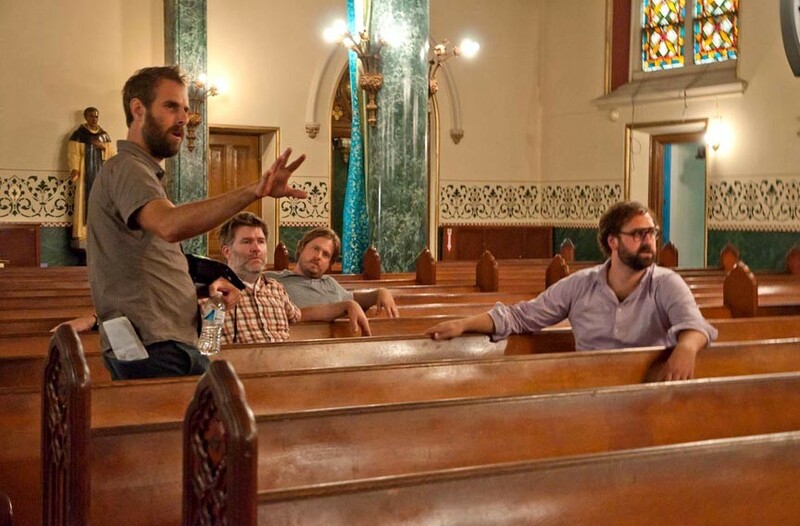 Alverson, left, directs a chapel scene starring James Murphy of LCD Soundsystem fame, Tim Heidecker and Eric Wareheim. When the first 10 minutes were leaked after its 2012 Sundance Film Festival premiere, it wound up the most pirated independent film of the year. Alverson moved to Richmond in 1995 under the auspices of getting away to write a screenplay — though others told me it was to help a friend through a drug problem, which he confirms. Early on, he shared a house with the band Technical Jed. 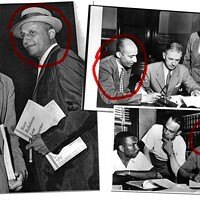 Meanwhile Alverson was taking writing classes at Virginia Commonwealth University and, when he wasn’t sleeping on floors, picked up side gigs teaching rich kids how to skate in the West End. A vegan and atheist by this point, Alverson washed dishes at Bottom's Up, then taught himself to cook and worked at Helen’s and Ipanema, where he helped design the original menu. Playing music brought Alverson out of his shell. A singer and guitarist, he formed an acclaimed band called Drunk (the second release on Jagjaguwar). But it was his next band, Spokane, which featured spare instrumentation and sadly quiet songs, that became his first true engagement with an aesthetic, namely minimalism. That band toured Europe twice and earned swooning critical kudos in outlets such as Pitchfork. 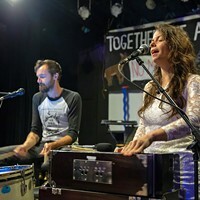 Courtney Bowles, who played drums and glockenspiel for Spokane, dated Alverson for 13 years and co-produced his first two films. They remain close friends. Even with a successful band, Alverson had bills to pay, so he began working on construction crews and as a self-taught carpenter. “Rick is an autodidact -- and when he takes on something, he’s not there just to learn the basics, he becomes an expert practitioner,” says former Style reporter Chris Dovi, a longtime friend who has small cameos in his first two films. Dovi hired Alverson to help build an addition onto his house. Learning carpentry was better than any formal education he ever had, Alverson says. He practically lived in the Richmond Public Library, devouring information on how to hand-build his 1,800-square-foot house in Church Hill, a replica 19th-century federal home that Style covered when it was being constructed. In the film world, this wouldn’t be the case. 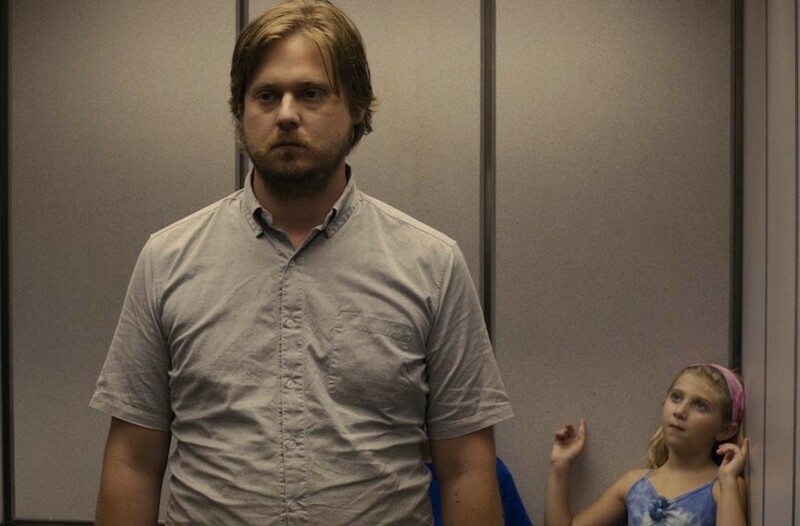 Comedian and writer Tim Heidecker (“Tim and Eric’s Billion Dollar Movie”) turned in an acclaimed dramatic role as a wealthy and entitled slacker named Swanson in “The Comedy.” The film follows the boredom and recreational cruelty of a group of Brooklyn friends. By 2008, the film industry had gone digital with quality improving to near celluloid and Alverson saw his opening. He bought a relatively inexpensive camera and challenged himself to make his first feature film before turning 40. From the beginning, he and O’Leary used the bare minimum for scripts, with most running between 20 and 40 pages — a far cry from the average Hollywood screenplay of 120. Most scenes basically were controlled improvisations. “We just had conversations,” O’Leary says about playing the title role in Alverson’s neo-realist debut, “The Builder,” inspired by the films of John Cassavetes and Mike Leigh. This film’s lead character, an Irish immigrant building a Shaker-style post-and-bean house in rural New York, is closer to Alverson in real life that any of his other characters, according to several friends. Within five months, Alverson followed that film with the moving “New Jerusalem,” which featured veteran actor and musician Will Oldham (“Matewan”) as a friendly evangelist to O’Leary’s former military supply guy turned tire salesman. 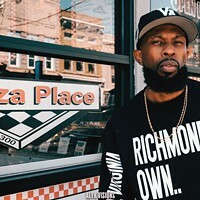 Alverson’s first two features contain many familiar and lovely images of contemporary Richmond — a kitchen scene at the old Perly’s, bike rides through Church Hill, friends swimming in the James River against a golden sunset. Also it was obvious that a pattern was developing of the director coaxing brilliant performances from nonactors. Alverson says the early films scrutinized a utopianism at the root of American culture and the often great disconnect between people and their ideas. His loyalty to his own curiosities has made him acutely aware that the model for creating art films is different in America than anywhere else in world. So far, Alverson has made his low and micro-budget films for less than a million dollars, working with independent producers such as Mike S. Ryan, who’s financed similarly bold directors such as Todd Solondz and acclaimed Hungarian filmmaker Béla Tarr, as well as the film “Junebug,” one of the lowest-budget films ever nominated for an Oscar (which also featured Oldham). Alverson’s next film, “The Comedy,” fully embraced confrontation with both the narrative and the audience. His breakthrough struck a nerve, coming when popular opinion began to swing against a gentrified Brooklyn. 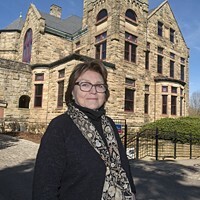 In the wake of “The Comedy,” Alverson received a fellowship from the Virginia Museum of Fine Arts and was invited to various speaking engagements at universities to discuss his work. Although he keeps a low profile, Alverson has lived in Richmond for more than two decades, longer than anywhere in his life. Plenty of people have urged him to hire an agent and move to Los Angeles or New York. Everyone he knows who makes movies already lives in those cities, he says, and even his sister and parents now reside in the Los Angeles area. It’s not just Richmond’s affordability keeping him here. Alverson explains that he’s grown attached to his Church Hill neighborhood, which he’s watched progress from street violence — bullets once came through his window, nearly hitting his girlfriend — to its current Brooklyn-like renaissance with rising home prices. Because he wears so many hats: writing scripts, pitching his films, finding investors, casting, directing, editing, and traveling to promote, as he’s doing now with “Entertainment” — he’s often only here two weeks at a time. In the last month, he’s been to Los Angeles, Chicago, Philadelphia and Switzerland with the film. Rick Alverson talks about the film cycle. That’s not saying he doesn’t want larger budgets, which mostly means working with bigger-name actors. This especially is true for his Reconstruction-era film, “The Well-Dressed Man,” originally from a short story by O’Leary. Oscar-nominee Michael Shannon is one of the actors who he’d love to cast. The script follows freed slaves settling near a small Appalachian community of white, working-class immigrants and descendants of the Old South. Upheaval arrives in the form of a black, Northern educator founding a school. Alverson says that living in Richmond made the project more personal. “Seeing kids shot and fatherless families in Church Hill — these things have a direct tether to this period when there was a brief time when things could’ve gone another way,” he says. Forget financing a racially sensitive film, Alverson can’t even find a theater in Richmond that shows the kinds of movies he wants to see. So he ends up watching them online at places such as Fandor (“It’s embarrassing,” he says). That’s a big reason why he supports the creation of the Bijou Film Center. Bijou co-founder James Parrish describes next week’s Byrd screening as a trial partnership with the Institute for Contemporary Art, which hopes to bring contemporary filmmakers to town. Parrish envisions guest filmmakers premiering at a state-of-the art ICA screening room, and then continuing the run at the Bijou when it has a brick-and-mortar spot. Alverson is a great example, he says, noting the director was “anointed by the art world” with the selection of “Entertainment” for closing night of the Museum of Modern Art and Film Society of Lincoln Center’s 44th New Directors/New Films series earlier this year. And what about the new film “Entertainment”? Call it a road movie to the end of the American dream, with a depressed, phlegm-hocking, cocktail-spilling comedian at the helm. Scott Foundas, a Variety film critic who recently took a job as a development executive at Amazon Studios, is a fan. 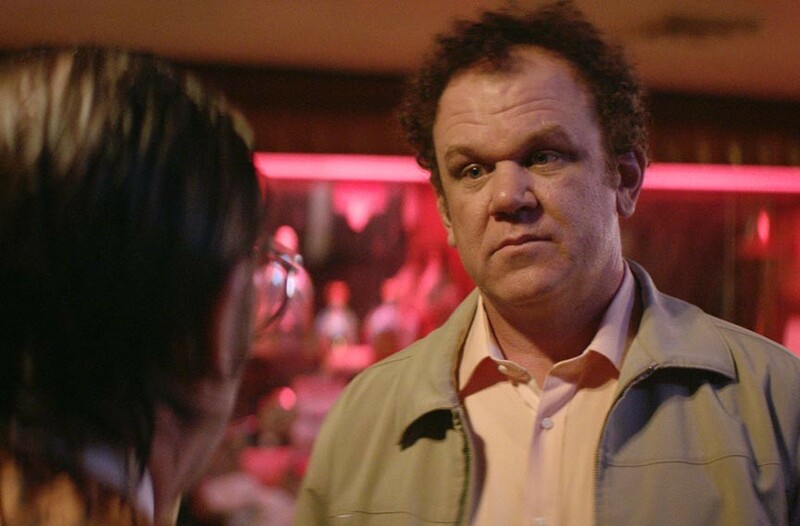 Indie film veteran John C. Reilly (“Boogie Nights”) plays cousin John in the forthcoming Alverson film, “Entertainment,” which is being distributed by Magnolia Pictures. It opens nationally Nov. 13. For those who come to the Byrd screening, or catch it Saturday at the Virginia Film Festival in Charlottesville, the filmmaker’s advice is to be prepared for dealing with uncertainties. He maintains that he’s interested in his films reaching larger audiences even if his methodologies undercut that goal. For now, the growing local film community can still claim him. Th Bijou presents "Entertainment" on Sunday, Nov. 8 at 6:30 p.m. at the Byrd with director Rick Alverson holding a Q&A after the show. Also, lead actor and comedian Neil Hamburger will perform after at New York Deli. Tickets for the screening are $7 in advance at Steady Sounds and $10 at the door. 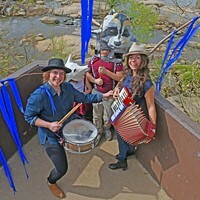 A video for the song "Animals in the Zoo" by Leah Devora from the soundtrack for "Entertainment."